A pill box is a must when you take more meds than you can count on the fingers of your hand in different combinations at different times of day and night. It’s a pity that the pill box doesn’t have an inbuilt alarm to notify me that it’s time to get high, but at least I can clearly see if I’ve taken my meds already or not. Also, it’s a rather awesome pop of colour in my somewhat bleak home existence. Getting high was never so much fun. The box looks like a rainbow! Yes, it’s much easier and much more fun now 🙂 Thanks for stopping by! In my youth, any time was time to get high 😀 Useful device, especially for people like me, in memory terms I am to goldfish what goldfish is to elephant..
At my age, not every time is time to get high, I get high on schedule 😉 I read an article the other day that a goldfish has a longer memory span than an average internet user. So, whatever you make of it. Haha, you’re hilarious 😀 Also, I don’t know what you’re talking about either. Goldfish? Me neither. Swiftly moving on..
That’s for the best. Wait. Where I am and how did I get here 😉 ? I know. I get that all the time. I blame Google Maps..
Hope the pill box reminds you to take your pills. I can’t even remember to take my vitamins, doctor prescribed for lack of Vitamin D but I don’t even believe they work. You just never remember…. 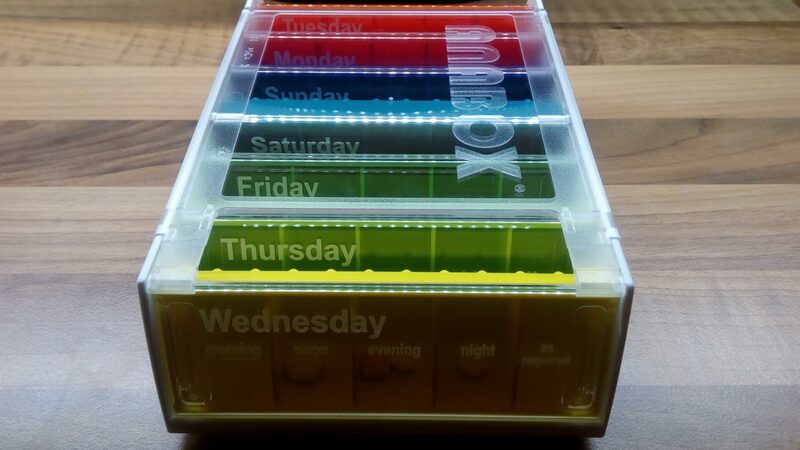 Yep, I love my pill box very much, it does the trick plus it’s a nice decoration too… I’m still not used to taking so many meds, so I tend to forget sometimes, which shouldn’t happen with prescription medication. Pretty box …. does it purr ? In my case, getting high is more like getting normal, as my normal is extremely low. If that makes any sense. Great colours, and it works! In Swedish, they’re called «dosett» 🙂 I have only ONE [pink] pill to take every morning. Still … I have to focus really hard on doing so, otherwise, a few minutes later I’m not sure whether I took it or not. It’s terrible. I’ve never experienced getting a high from a pill. Probably just as well. Have you seen the two, new, free WordPress themes? I applied one of them on hernibs. Ridiculously, I check WP Theme Showcase each week and I missed these two new themes! Thanks for the heads up! I wonder what happened. Did they forget price tags? 😉 Also, where is the twenty seventeen theme? How could they forget to introduce their new year’s default theme? WP is getting weirder and weirder. Yup, here it’s pink — back home it was white. The theme you’re running on Hernibs is pretty cool and original. I was thinking of applying the other one, which is more suitable for me, but I’m feeling too lazy and uninspired… I seem to have nothing to blog about in the first place these days. I know, right! I used to blog every day, sometimes more than one post… But I felt like blogging yesterday and produced a post. Not one I’m proud of, but the act of blogging helped me feel better. Looking forward to it! You’re dearly missed in the blogosphere. I’m a huge fan of all things depressing, melancholy and morbid. This is just to my taste. Thank you. Haha, I think you’re old enough to have a cat now, and cats are awesome in that they usually don’t mind being home alone while you’re at work. I’m just on my way from a conference, and the cat was home alone overnight – she surely didn’t enjoy it, but I’m also sure she’ll be fine. And I’m glad you like my pill box! It’s a huge help and cute looking too! I see! There’s never too late. I have these as well but mine have to be in the correct order: red, orange, yellow, blue, light green, dark green and purple. Really annoys my kids. I’m with you on this OCD thing as ordering things by colour. I’d order mine in the right order too, but unfortunately, they are already labelled with days of the week, so I can’t shuffle them around as I like. My lids slide off so I made them the way I wanted. Simple fix and it makes me happy.